Small local restaurant 3 minutes walk from the home , local supermarket with bakery 6 minutes walk from home , pharmacy and local cafes all 5 minutes walk away . Dear guests.. ....please note that i live in the basement flat of the property , you have your own entrance i have my own entrance , it is very private all my reviews are with me staying in the basement flat . My windows do not look out on to your space , the garden is super , very private with tall hedges . I like to be invisible , unless you need help i am not far . I own a home in Lisbon and also stay there at times . Beaches, mountains, culture, shopping, water sports, golf, riding and more. Only 10,15 minutes walk to the beach and atmospheric town of CASCAIS with its lively center, beautiful historical houses, museums, art galleries,marina, shops, cafes and restaurants, a great market on Wednesdays. Marvellous promenade by the sea to ESTORIL. Casa da Guia nearby is a 19th century manor house overlooking the ocean with restaurants, cafés and some interesting shops. Sintra is a dramatically beautiful mountain village with ancient castles and palaces to explore. Only 10 mn drive to the protected coast line and beaches of Guincho, Adraga, Azenhas do Mar and the lighthouse at Cabo da Roca, most westerly point of Europe. ONE OF THE MOST DRAMATIC TRAIN RIDES IN EUROPE follows the coast into the heart of Lisbon in just 30 mins. Surfers Paradise), 15 minutes. Good night life can be found locally or in Lisbon. GOLF: Golf Details: There are 5 golf courses locally, all within 2-5 miles. 1. Estoril Golf -designer-Mckenzie Ross- 2 courses- 18 hole, 69 Par, 5238m, Championship course. 2. Golf Estoril-Sol - designers are John Harris / Ron Fream - 9 hole, Par 31, 1749M Beautiful. 3. Penha Longa is a two course location - main course 18 hole is par 72 and 6228 metres in length. Designer R.Trent Jones II. Championship course - spectacular. 4. Quinta Da Marinha is par 71 - 6014 m - Championship course - Atlantic views.Designer R.T. Jones. 5. Quinta Da Beloura - designer- William Roquemore, 18 holes, 5817m, Par 73, 6 lakes- Championship. Passports are available from Estoril Tourist office for all courses. 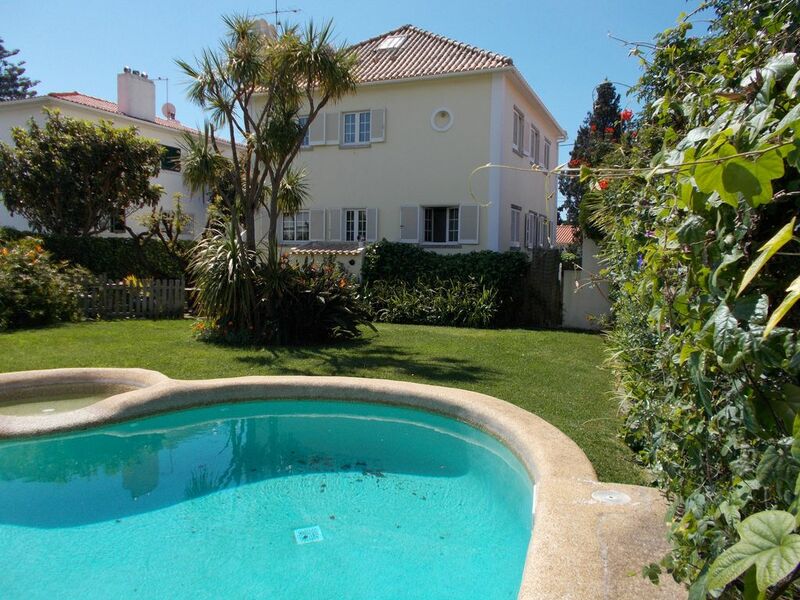 I fell in love with Cascais as a child while visiting family and purchased this home in 1996. Cascais is a slower pace than Lisbon, yet only 30 minutes away on the train. I love the fact that the house is 10 minutes walk in to town, yet has a lovely garden and pool space with good privacy. I love the windows in this home. Casa Catarina has sun shine all day streaming in. I chose this house as the street is quiet being a one way street. The house is situated in the center away from the road. I fell in love with the arched ivy entrance over the gate ways, which gives you a cottage feel. All my guests have commented on the comfort and feel good atmosphere of Casa Catarina. So far lots of Happy guests, and I look forward to greeting many more. See you soon! x Vicky . Please use bathmat to avoid slipping in bath ! W.C . and sink , out side by the pool ,plus out side shower . ask owner , may be an additional cost , depending on time of year . for toddlers , and young children . general mix of toys for young kids puzzles books , beach toys . We offer cable TV and DVD & VHS player is also provided, with rentals just a few minutes away (films in original languages). high speed wireless internet as well. there are 7 sun bed's by the pool aria . Babysitting can be arranged at the house (so you can take a well-earned night out on the town!). Vicki is a wonderful and helpful hostess. She rang us to update us on any relevant information during out stay. Her house is a beautiful peaceful sanctuary tucked away in a residential part of Cascais yet only a ten minute walk to town. The kitchen is fully equipped with every utensil you will require for cooking. The garden is beautifully maintained and a welcome relief from the heat of the day. We were so sad to leave and would happily return and would highly recommend this beautiful home. This was the second time we stayed at Vicky's house and we loved it. The pool and outside area was perfect for our 18 month old. Cascais is a brilliant place with loads of lovely restaurants and we really enjoyed the beach which felt very safe for a little one. We really enjoyed our time in Casa Caterina. The house is well-provisioned with high quality linens and towels. Kitchen is very well equipped and the pool and garden a joy for 3 generations of our family to enjoy together. Great place! Very helpful and reliable host! The pictures captured very well the house and the garden. The pool was even a bit better in reality than in the pictures. The host was very friendly and responded to all our requests promptly. It was quite tricky to park the car in the yard. Spent a wonderful 10days in Cascais. House was perfect, spacious, comfortable with everything we needed. Vicky was there for a warm welcome, ready to help with anything but at the same time very discreet (she was in the basement flat but we didn’t see or hear her all the time we were there). Cascais is a lovely town...we enjoyed walking down to town and if we had much shopping would take an Uber up to the house (only 2-3 €)...other taxis were 6€. We didn’t need to hire a car and took the train to Lisbon and the bus to Sintra and an Uber back that came to the same price as the bus fare if you are 4. Bike ride to Guincho was great fun and quite an easy ride. Thank you for your review , we really appreciate that you took the time . It was a pleasure to meet you . Sounds like Uber is the way to go , good tip for future guests , so think of getting the APP if you do not have it . Train in to Lisbon is the best option as even if you do rent a car parking in the city can be a challenge . Biking it is great fun , and electric bikes are are plentiful in town for renting . Wishing you a super summer , best wishes Vicky . Cascais is located just 25 km west of Lisbon (25 mins from Airport)along a spectacular coast which begins at the Tagus estuary and takes you to the westernmost point of Europe - Cabo da Roca. Cascais has beaches, cafés, pubs and shops. There is a promenade along the water with beach coves and sunny cafés. Casa da Guia nearby, overlooks the ocean with restaurants and cafés set in the grounds of the old manor house with stylish shops and boutiques. Sintra also nearby is a dramatically beautiful mountain village with castles to explore like Quinta da Regaleira as well as cafés and shops. On the North side of Sintra a beautiful coastal road takes you to the lighthouse at Cabo da Roca the most western point of Europe, Praia Adraga, Azenhas do Mar. There are 2 free rental bike stands down in Cascais at the train station and at Casa da Guia. Just leave some identification and take them for the whole day. Ride along the ocean cliffs on the walk/bike path.